At the start of this journey called “planning our wedding” I was so excited! But my future husband knew I needed help. He wanted me to be as stress free as possible and we came across Wendy Garcia and her company Your Day Weddings & Events. From the first meeting we loved you! You asked the right questions, answered ours, made us laugh and comfortable at the same time!! But we never knew that from that first meeting we would become satisfied newlyweds and great friends!! We planned our wedding day for a year and everything and everyone you put in front of us just worked! From my crazy ideas, Pinterest obsession, my mind changing All the time to advice on life to asking how our day went. You just cared! I’m sure we could write a book with all the texts we sent back and forth! You brought us your A team and they all enhanced our day with such ease! You said everyone that you brought us would be wonderful and you did not disappoint. We spent so much time putting things together and taking things apart. You took the time and set up a mock up so we could preview the day and you told me to trust you with my vision. I did and I couldn’t have been more pleased. You exceeded our expectations, you blew us and our guests out of the water! You are made for this industry and you have proven that!!! Anyone looking for wedding or event planning NEEDS Wendy in their lives!!!!!! We cannot thank you enough for helping create the magical experience of our daughter’s wedding day. I have never enjoyed myself more, not to mention the love that was created, with all of your help. Maybe I am a little biased, but that wedding was the greatest show on Earth! My husband and I have attended several events hosted by Wendy. The food, the decor and the music are always great! Wendy creates an atmosphere that ensures every guest has an enjoyable experience. Given her unique abilities, I have no doubt Wendy and Your Day Weddings & Events will make your special occasion a memorable one. I believe she was truly “born to do this”! Wendy was amazing! She helped with every part of planning my wedding. My wedding planning was overall around 2 years long. She helped with the wedding venue, the flowers, the cake, the photographer, my invitations, and my gown. She even went to a few of the bridal shows with me to meet some of the vendors to try to narrow my options down. She totally customized and put together all of my wedding centerpieces as well. On the day of my wedding she made sure everything went smooth and that everything was set up the way I dreamed it would be. She also partners with an amazing DJ, who really made the night! Everybody had a great time and they’re still raving about him and my wedding! I would recommend her services to everybody. Wendy was absolutely fantastic! I was a bridesmaid in a wedding she planned and it was flawless. I know my friend was able to enjoy her wedding and not worry about a single detail that day. As a guest of the wedding I had an amazing time! It was one of the top weddings I have attended. From the gorgeous fall decorations, the great DJ and very yummy food. She’s one of the best I’ve seen! Wendy Garcia is more than just a wedding planner. She is a great helper, advisor and negotiator. Wendy went above and beyond to make sure our wedding was great. Not only had she created gorgeous centerpieces and made all of the arrangements for us, but she also helped me out with finding a dress and made a wedding bouquet for me. We couldn’t ask for a better wedding planner, and I would recommend Wendy to everyone. She is the best at what she does. Wendy really captured what we wanted to emulate at our wedding. 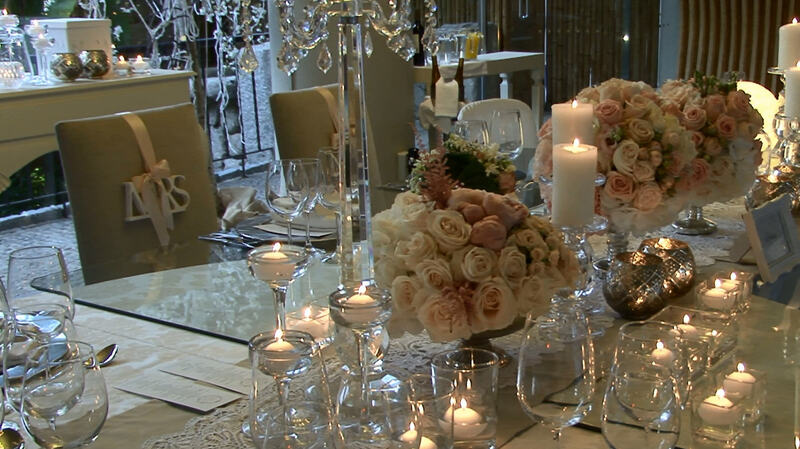 The centerpieces she created were so romantic, elegant and really added beauty and class to our wedding. We would highly recommend her to anyone looking to have a beautiful focal point for their wedding! She had great connections to save us money and stress of planning a wedding in a short six week time frame. Her patience and positivity really helped us make some of the more difficult decisions throughout the planning process. She did a fantastic job in such a short amount of time! Thank you for such a beautiful start to the next chapter in our lives! Having “Your Day Wedding and Events” by Wendy Garcia coordinate my daughter’s wedding was the best decision I could of made. Wendy was by my side from the minute we hired her. She went above and beyond the call of duty. Wendy partners with an excellent Production DJ/Sound Engineer. The music was perfect, timing was perfect, and he had everybody on the dance floor having an awesome time. Wendy did all the decorating and customized the centerpieces, and they were beautiful. She listened to my daughter, saw her vision and they were beyond perfect. The thing that sets Wendy and her company above the rest is the personal interest she has in her clients. She wants nothing more than to make your occasion a memory that will last a life time. I was not just another “job” to her. I became her friend, and she would stop at nothing to make sure that my daughter had everything the way she wanted it, at the best possible price. If things got a little rocky she smoothed it over instantly. My husband and I are forever indebted to Wendy, as she made one evening into a lifetime of memories for all of us. Thank you! If you would love to have the perfect day for your “I do’s”, please hire Wendy Garcia. She put together the most amazing wedding for my sister, more perfect that we imagined. From the very first day that we hired Wendy, peace and harmony started to flow, literally! From the small things such as specific table number holders (which she had found and ordered in less time then it took us to text her our request! ), providing the perfect DJ, and somehow putting together amazing table centerpieces that were better than we tried to describe, Wendy knew exactly how to create everything we needed, based off of our general ideas, but better. Planning the wedding was much more calm and easier knowing we had Wendy. The day of was absolutely perfect. It was so comforting to know that everything would be handled perfectly and we didn’t have a worry in the world because we knew Wendy was there taking care of everything. Everyone had such a blast, including the grandparents, children, and even the guests who didn’t know many people. My sister had the happiest day of her life, and I know when my day comes, I am putting Wendy on speed dial! There are NO words to express our thanks and gratitude for all you have done to make our wedding the most truly MAGICAL night of our lives!!!! YOU are AMAZING!! You turned the most important day of our lives into a DREAM come true, not just for us but for our family and friends as well! They truly enjoyed the day, we still have people tell us what a wonderful time they had that day! You have such a BIG heart and are so Creative and Patient. We are so blessed to have had you in our lives as our planner and ever more as our new friend!!!! Thank you for taking the time to get to know us, and our circumstances and then expressing our lives through your eyes and design, it was so perfectly beautiful! Your PASSION, DEDICATION, and CHARACTER Shine through in all that you CREATE!!!! To say that you go above and beyond for your brides is truly an understatement! We LOVE YOU!! Thank you for making it ALL come together!!! A special Thanks goes out to Eric Roberts our DJ and your business partner!!!! From the beginning you said he was amazing, raved is more like it, and rightfully so! Sean and I could not believe how seamlessly he kept the party going that night, words simply don’t do him or his skills as a DJ justice except to say PHENOMENAL in every aspect from the beginning to the end!!! He was simply put EXCEPTIONAL!!!!!!!!! We look forward to working with him and you both again !!! Wishing you all the blessings and success you can handle in this business of making dreams come true in the future!!!! !